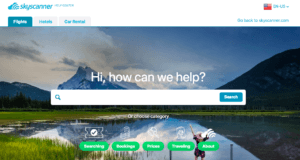 Founded in 2001, Skyscanner is a global online travel search company that compares millions of flights, hotels and rental cars to find the best deal for their customers. Unlike most travel search sites, Skyscanner searches even the smallest of airlines and other companies to truly find the best price. Their search is available in over 30 languages and they receive over 35 million site visitors per month. The goal for Skyscanner was to give their community better FAQ search results before a purchase was made. Within a few weeks, Inbenta migrated Skyscanner’s existing FAQs, using our knowledge base spider. Now, when customers have a question, the results that are presented are far more relevant. Within only a couple of weeks, Skyscanner is seeing a great increase in their self-service numbers. English, Japanese, Korean and Chinese.